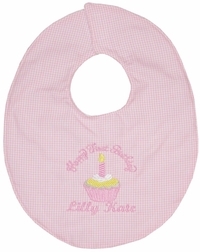 Home > Babies & Infants > Bibs & Burp Cloths > 1st Birthday Bib, Happy Birthday Bib for Boys And Girls. 1st Birthday Bib, Happy Birthday Bib for Boys And Girls. These are precious 1st-first birthday bibs backed in a soft, terry fabric. The bib is available in a variety of colors and embroidery. 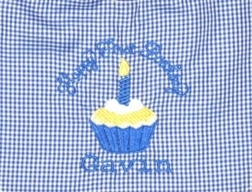 It is sweetly embroidered with Happy First Birthday and a cupcake. Your little one's name is monogrammed below the cupcake.